67 1/8 by 69 in. 170.5 by 175.3 cm. 65 3/4 by 64 1/2 in. 167 by 163.8 cm. 103 1/4 by 103 1/4 in. 262.3 by 262.3 cm. 69 by 68 5/8 in. 175.3 by 174.3 cm. 103 by 154 in. 261.6 by 391.2 cm. 71 by 89 5/8 in. 180.3 by 227.6 cm. 63 3/8 by 63 3/8 in. 161 by 161 cm. 68 3/4 by 68 3/4 in. 174.6 by 174.6 cm. 44 3/4 by 43 5/8 in. 113.7 by 110.8 cm. 33 1/2 by 33 1/2 in. 85.1 by 85.1 cm. 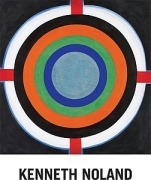 Mitchell-Innes & Nash is pleased to announce its first solo exhibition of paintings by Kenneth Noland, on view in the Chelsea gallery from March 17 - April 30. The exhibition, “Kenneth Noland: Paintings, 1958-1968,” will feature major paintings dating from the artist’s first decade of mature work. It will include significant early examples of the circle, stripe and chevron compositions that would become Noland’s signature forms throughout his career. The exhibition will be accompanied by a fully illustrated catalogue with an essay by art historian Paul Hayes Tucker. Kenneth Noland (1924-2010) is among the most influential Post-War abstract artists and one of the central figures of Color Field painting. His unprimed canvases with geometric forms painted in thin washes of pure, saturated color forged a new direction in abstract art. The artist’s stated aim was to explore "the infinite range and expressive possibilities of color." Later referred to in the New York Times as “paradigms of American plain statement,” these spare, reductive works were seen as bold departures from Abstract Expressionism and as ‘minimalist’ painting. This exhibition and extensive catalogue will present new insight into the artist’s life, his influences, and the impact American popular culture had on his art and vice-versa. In the late 1950s and early 1960s Noland began working with two motifs, the circle and the chevron, which would have lasting importance in his work. These seemingly simple forms resonated deeply within Noland’s history, calling to mind badges on military uniforms from his army days, logos for cars and other consumer products ubiquitous in the post-war economy, and even the theories of Wilhelm Reich whose writings Noland encountered in the 50s. The catalogue essay by Paul Hayes Tucker explores these themes in depth, allowing for a dynamic new understanding of Noland’s art as inextricably linked to the ‘atomic age’ in America. Noland was featured in a number of international survey exhibitions that helped define American art in the 1960s: the Venice Biennale XXXII, organized by Alan Solomon of the Jewish Museum; Documenta 4, the final Documenta organized by founder Arnold Bode; “Post-Painterly Abstraction” curated by Clement Greenberg at the Los Angeles County Museum of Art in 1964; “The Responsive Eye” curated by William C. Seitz at the Museum of Modern Art, New York in 1965; and “New York Painting and Sculpture, 1940-1970,” curated by Henry Geldzahler at the Metropolitan Museum of Art, New York in 1969. About the Artist: Kenneth Noland was born in 1924 in Asheville, NC. After serving in the Air Corps of the US Army during World War II, he attended Black Mountain College in North Carolina, where he studied under Josef Albers and Ilya Bolotowsky. He developed a friendship with painters Helen Frankenthaler and Morris Louis early in his career and was championed by influential critics Clement Greenberg and Michael Fried. Noland later developed strong associations with Bennington College in Vermont, where Anthony Caro, Jules Olitski and Paul Feeley were instructors. Noland’s work is included in countless museum collections in the US and internationally. His 1977 retrospective at the Solomon R. Guggenheim Museum in New York traveled extensively. More recent notable exhibitions include “Action/Abstraction” at the Jewish Museum, New York, 2007. In May 2010 the Guggenheim mounted the exhibition “Kenneth Noland, 1924-2010: A Tribute,” to honor the late artist and his long history with the museum.